The Dutchmans Puzzle Quilt Block is the perfect block for learning to make "Flying Geese". The entire block consists of eight flying geese units! - Six 3 7/8" squares. Cut them in half diagonally to make twelve triangles. These triangles go all around the edge of your block (shown above as white fabric). - Two 3 7/8" squares. Cut them in half diagonally to make four half square triangles. These make the center pinwheel, shown in light green in the above diagram. - One 7 1/4" square. Cut this twice diagonally to make quarter square triangles. I have colored these pieces aqua in the above diagram. - one 7 1/4" square. Cut twice diagonally to make quarter square triangles. See the blue triangles above. Sew together eight "flying geese" units as shown below, making sure to match the points at the bottom of the large triangle. First sew (right sides together) the left small triangle to the large blue triangle by matching the points at the bottom of the diagram. 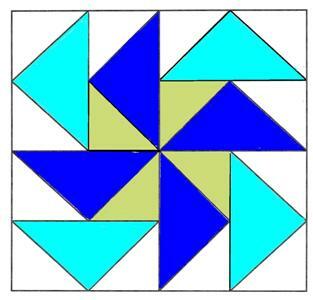 The top point of the green triangle will overlap the blue piece by about 1/4" at the top. Sew a 1/4" seam and press away from the center. Next place the white triangle on top of the large blue triangle, matching the bottom points. The top point of the white triangle will overlap by 1/4" and your seam line will go over the green seam at the top. These two seams should intersect by 1/4". Perfect, now repeat three more times. Make four of the two-color ones shown below. Follow the same instructions for the turquoise and white units. Now sew one turquoise unit on top of one green and blue unit. Do this for all four pairs. Lay out the units beside you, and sew the top row, then the bottom row. Now sew the two rows together, and you are finished your Dutchmans Puzzle Quilt Block! Finished with "Dutchmans Puzzle Quilt Block" Return to "Learn to Quilt"
Or go to "Weathervane Quilt Block"